One of the key elements of tackling content marketing for your organization is effective content creation that is part of a consistent series, similar to the idea of a television series. Content gives your business the opportunity to reach your audience on a regular basis, framing the conversation around the value and information your organization can provide a customer as opposed to pushing your product or service offerings. According to Content Marketing Institute, social media and blogs reach eight out of 10 of all U.S. Internet users, which means creating and distributing content across these channels is a powerful way to reach your customer base. While at the same time, due to the amount of content being published everyday, it’s very difficult to stand out among the chatter online and engage with your audience. A series of content can come in many forms, like a series of the same type of content such as a blog post or mix of different content all focused on the same subject area, but any series should carefully consider the information herein to successfully reach an audience. For example, the Shapeways blog does a successful series called Designer Spotlight in which they interview designers in the 3D printing community a few times a month. These articles help bring a different perspective to the blog, allow some of the top designers in the community to showcase their work, and give their audience a bi-weekly update on some of the best shops on their website. Whether you’re just developing content for your business for the first time or you’re trying to build a smarter content strategy from your existing efforts, take note of the following components of an effective content series. Before moving forward with developing any content series for your organization, clearly understand the goals of your content marketing. By having a clearer vision of your goals overall, you’ll be able to then apply specific goals to each series you’re thinking of creating. Certain series of content published by your company can share the same goal, while others can have their own goals entirely. The thing that’s most important is that each series of content contributes to the overall success of your organization in reaching your audience, growing the visibility of your offerings, and increasing sales in the long-term. When brainstorming what series of content to consistently create, match each series with one or a few goals to stay on track and ensure your efforts have benchmarks to help better measure success. What makes a series of content worth sharing consistently with your audience is its regular focus on the same subject. All of the subjects that your content series cover should relate back to the interests of your audience but also relate to your offerings and expertise in some capacity. 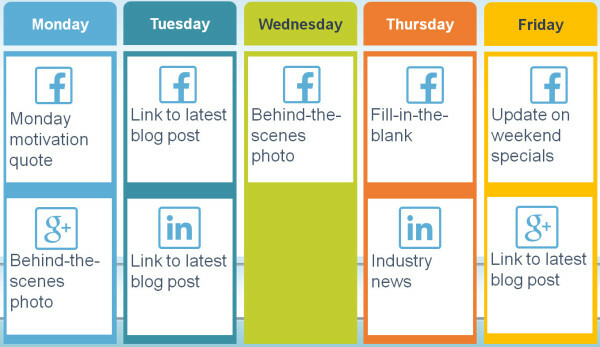 For instance, your organization could share a blog post, Facebook post, and a few tweets every Tuesday to summarize the news in your industry as it relates to your business. This way you’re providing value to your audience without having to craft too much new content for that particular series. The series need to focus on one or a few subjects in order for them to be recognizable as a frequent series your organization shares. In some cases it may make sense to address your series by name, which should be based around the subject the series regularly addresses. Your content series doesn’t necessarily need a name, which is why this component didn’t get its own section. Many series don’t need to be called out as a series and can just regularly be positioned as content your organization is sharing. Every Friday the makeup brand shares an offer on Facebook through their Fan Fridays series in which they reward news fans with a free makeup sample. This technique has helped grow their audience significantly while regularly delivering value to their existing community who always has the opportunity to take part in offers as well. They felt it necessary to name this series in this instance to clarify that they are trying to give back to their fans for joining their community and that the series occurs weekly on Fridays. When it comes to what type of content to share as a part of a series, it really depends on your goals and your audience. Understanding what your goals are inform the best type of content to regularly use in your marketing mix. When it comes to some series of content your business produces, it’ll make sense to stick with one type of content throughout the ongoing series. While for others, it’ll make sense for the series to live across blog posts, video, social media, email marketing, and elsewhere. There isn’t an exact formula for what types of content to use in your series, but what is important is to experiment to see what works, to share quality information frequently, and to be where your audience is most active. Repurposing content is a common technique for extending the life of one of your content series to drive more results and therefore should be a common practice for experimenting with different types of content to see what works. For example, if one of your content series is focused on a weekly blog post, try also creating tweets, blogs on Tumblr, and images on Pinterest that represent that series as well. All of these pieces of content should point back to the blog post in this instance, creating one consistent message for that update of your series. One of the key attributes of a successful content series is repetition. Developing the right frequency of publishing for each series is key to keeping the attention of your audience while not overdoing it. The key to finding the right frequency with your content series is testing to see what works well with your audience and what drives results without being annoying on each particular channel. Certain channels demand more content than others in order to stand out, which would require increasing the frequency of content you’re publishing to best meet the needs of your audience. For example, E! Online tweets from its Twitter account multiple times every hour to best reach their followers with relevant content. Most social media channels require multiple updates a day like Twitter or Instagram in order for content in your series to get seen by enough of your audience. In some cases, occasionally paying to promote your content on social media can help to further boost its visibility to ensure its gets in front of the right customers as well. Sharing content on your blog doesn’t have to happen as often, since blog content is typically longer and requires more time to digest. Publishing certain types of content less often will drive stronger results for your organization, which can be determined through testing. Regardless of the subjects your content covers, the type of content, or the frequency of your content, it should all tell one overarching story about your business. Creating content that tells the story of your business, your offerings, and your expertise is important regardless of what series it’s a part of. Each series of content doesn’t necessarily have to strongly relate to one another, but they must all relate to the overarching story of your business. Your company’s story is clearly defined by what your brand stands for, what your offerings are to customers, what problems your services solve, and what customer base you serve. It’s important that each content series relates back to the overarching story you’re trying to convey to your audience. Lastly, since a series of content is often planned, it might make your company more prone to only sharing content that is planned and that perfectly fits within one of your series. Regardless of the success of your content series, make sure that your company is still occasionally creating content in real time to react to current events and different unexpected happenings occurring in your industry. Don’t sacrifice your flexibility as an organization when it comes to content creation, or you’ll likely miss out on some key marketing moments to better reach your audience. Also, it’s completely fine to occasionally publish a piece of content that will make sense as it relates to your business, even though it may not fall within one of your content series. When it comes to content marketing, it’s ideal to have an organized strategy in place that’s flexible to cater to the changing needs of your customer base and your business as it continues to grow. Images courtesy of Content Marketing Institute, Constant Contact, and Dan Pontefract. Need help creating effective content? A series of content that resonates at the right points in the sales funnel is key to a winning content marketing campaign. Digital Current’s team has over a decade of experience making digital marketing campaigns perform at the maximum, giving you more performance and more conversions for your sales funnel. “Regularly focus on the needs of your audience across the sales funnel” and recognize the need for different kinds of content at different funnel stages. Optimize the content system at each stage, and for each buyer type. A Content system includes everything about the content, from end to end: the content itself, the distribution, and the landing page the link points back to. You’re right about frequency, too. Too long between publishes and you’ll be forgotten. To often and you hit a point of diminishing marginal returns, while severely increasing your resource requirements. Hello again Steve, thanks for reading as always! Thrilled we are on the same page. It’s hard to find the right frequency, which is why so many fail at creating a successful content series. It’s all about experimenting to ensure you’re on the minds of your audience often enough, but not publishing too often either! What do you find to be the most difficult part of creating a consistent content series?